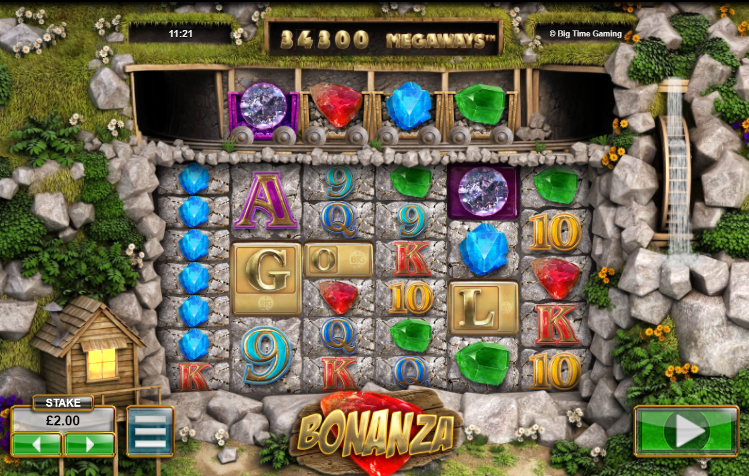 When you hear the game name “Bonanza”, you might expect this to be a megareel slot that follows the traditional slot machine theme. But then once this game loads, you will be thoroughly surprised by the game that is in front of you. It’s not at all as traditional as you might have expected! The title refers to the mega winnings you could get your hands on when you spin the reels and see what you unearth from the game mine. 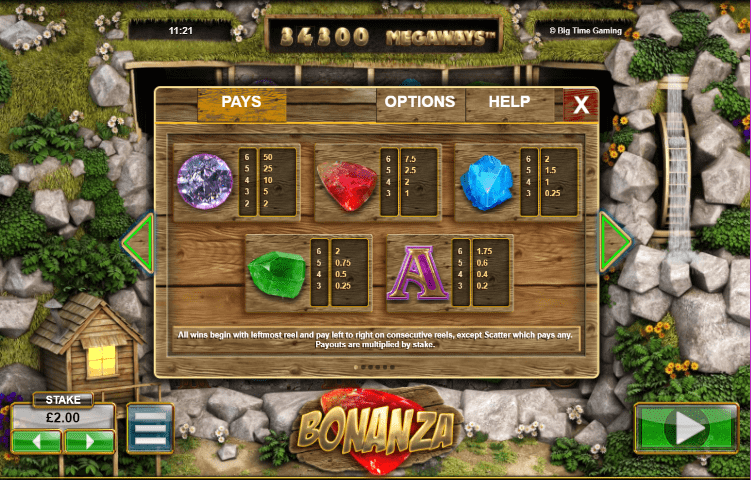 Bonanza comes from the developers at Big Time Gaming. Based in Australia, this games company has a limited number of online slot games as well as some traditional table top games. Even though they don’t have the biggest portfolio of games, they have still managed to create a reputation that most over developers would be very envious of thanks to their remarkable designs and animations. If you like Bonanza, you should also try out Viking Quest and Queen of Riches. Or click here to discover more games. This game’s design is certainly unique – the actual games board only takes up a small area of the screen. The reels look like they are on the face of a cliff and you will see a very detailed scene around them. Above them is a rickety old train track with a cart full of mined stones and precious jewels. To the left of the board is a wooden cabin and to the right is a waterfall turning a waterwheel. This design is certainly extremely intricate and the 3D graphics help all the stones, plants and flowers pop out of the screen. There may be just five reels on the board, but there are still an incredible 117,649 different ways you could win! As with any slot game, you just need to align the symbols on the reels. The majority of symbols are letters of the alphabet, but you will also notice a few precious stones and pretty gems. You’ll see that the mine cart will ride across the screen and bring some extra symbols with it. These add on to the second, third and fourth reel, which can increase your chances of matching symbols up. Some of the icons will help you increase your pay-outs. • WILD SYMBOL – If a stick of dynamite pops up on the reels, then you’ve just landed the Wild symbol! This will explode and replace every other symbol except any Scatters that are already on the board. • SCATTER SYMBOLS – There are four Scatters on the board: the letters G, O, L and D. You need to spin all four on the board at the same time to activate the free spins bonus. Bonanza is a very busy game with lots of bonus features happening at once. This could be a bit overwhelming for newcomers to the world of slot games. But once you are into the swing of things, you’ll find that it’s a very enjoyable game that is rich in rewards. Hopefully, there’s gold waiting for you in them there hills! If you liked this why not try out Bloopers.